This is a revisiting of Hänssler Classic CD94.227 so if you have acquired that, then you won’t need this unlike you have particular thing for the digitally remastered SWR tapes. I’ve not heard the Hänssler disc so can’t contrast but I doubt the difference is spectacular enough to warrant jumping ship. The focus of the three concertos is Janos Starker. 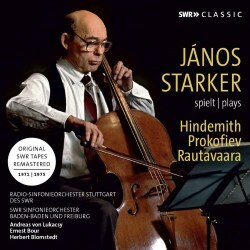 Starker greatly admired the Hindemith Concerto, calling it ‘the best cello concerto of the twentieth century’ and his playing of it is best known in the RCA CD of the mid-1990s. This 1971 SWR performance is hardly less impressive and marked by absolute control of focused tonal colour and expressive intent. Andreas von Lukacsy directs the SWR forces with architectural decisiveness. Even John Cage liked this concerto, especially the finale, and one can hear in its off-kilter orchestral march, against which the solo cello calmly treads its own ruminative passage, quite why it must have appealed to him. The concerto was written for Piatigorsky and I reviewed a rare live broadcast survivor in its incarnation on WHRA, conducted by the composer in 1943 – much edgier sound, of course, than the Starker and much older but a stunning performance. Prokofiev famously reworked his Sinfonia Concertante, Op.125 from his earlier Cello Concerto, Op.58 and for decades it was associated with Rostropovich, who earned the composer’s dedication. Starker plays it with unadorned lyricism and with almost viola-like tonal qualities – simplicity and directness are the watchwords and the brilliantly articulated finale shows his resources unruffled by technical demands. Bour directs admirably here. The compact 1968 concerto of Einojuhani Rautavaara was taped in 1975 with Herbert Blomstedt conducting. The Tranquillo section of the first movement generates a memorable lyric charge that’s expanded in the tranquil Largo and there’s a Martinů-like cadence (presumably unintended) in the brisk finale. A direct, unsentimental practitioner, Starker proves an admirable guide to these three concertos. Recorded balances are excellent and the tapes sound in first-class condition. Documentation is good too and there’s a fine colour photograph of the cellist characteristically unruffled and with waistcoat unbuttoned, on the front.